Engineers and scientists gathered around a screen in an operations room at the Naval Research Laboratory in Washington, D.C., eager to lay their eyes on the first data from NASA’s STEREO spacecraft. It was January 2007, and the twin STEREO satellites — short for Solar and Terrestrial Relations Observatory — which had launched just months before, were opening their instruments’ eyes for the first time. First up: STEREO-B. The screen blinked, but instead of the vast starfield they expected, a pearly white, feathery smear — like an angel’s wing — filled the frame. For a few panicky minutes, NRL astrophysicist Karl Battams worried something was wrong with the telescope. Then, he realized this bright object wasn’t a defect, but an apparition, and these were the first satellite images of Comet McNaught. Later that day, STEREO-A would return similar observations. Comet C/2006 P1 — also known as Comet McNaught, named for astronomer Robert McNaught, who discovered it in August 2006 — was one of the brightest comets visible from Earth in the past 50 years. Throughout January 2007, the comet fanned across the Southern Hemisphere’s sky, so bright it was visible to the naked eye even during the day. McNaught belongs to a rarefied group of comets, dubbed the Great Comets and known for their exceptional brightness. Setting McNaught apart further still from its peers, however, was its highly structured tail, composed of many distinct dust bands called striae, or striations, that stretched more than 100 million miles behind the comet, longer than the distance between Earth and the Sun. One month later, in February 2007, an ESA (European Space Agency) and NASA spacecraft called Ulysses would encounter the comet’s long tail. How exactly the tail broke up in this manner, scientists didn’t know. It called to mind reports of another storied comet from long ago: the Great Comet of 1744, which was said to have dramatically fanned out in six tails over the horizon, a phenomenon astronomers then couldn’t explain. By untangling the mystery of McNaught’s tail, scientists hoped to learn something new about the nature of comets — and solve two cosmic mysteries in one. A key difference between studying comets in 1744 and 2007 is, of course, our ability to do so from space. In addition to STEREO’s serendipitous sighting, another mission, ESA/NASA’s SOHO — the Solar and Heliospheric Observatory — made regular observations as McNaught flew by the Sun. Researchers hoped these images might contain their answers. Now, years later, Oliver Price, a planetary science Ph.D. student at University College London’s Mullard Space Science Laboratory in the United Kingdom, has developed a new image-processing technique to mine through the wealth of data. Price’s findings — summarized in a recently published Icarus paper — offer the first observations of striations forming, and an unexpected revelation about the Sun’s effect on comet dust. Comets are cosmic crumbs of frozen gas, rock and dust left over from the formation of our solar system 4.6 billion years ago — and so they may contain important clues about our solar system’s early history. Those clues are unlocked, as if from a time capsule, every time a comet’s elliptical orbit brings it close to the Sun. Intense heat vaporizes the frozen gases and releases the dust within, which streams behind the comet, forming two distinct tails: an ion tail carried by the solar wind — the constant flow of charged particles from the Sun — and a dust tail. Understanding how dust behaves in the tail — how it fragments and clumps together — can teach scientists a great deal about similar processes that formed dust into asteroids, moons and even planets all those billions of years ago. Appearing as one of the biggest and most structurally complex comets in recent history, McNaught was a particularly good subject for this type of study. Its brightness and high dust production made it much easier to resolve the evolution of fine structures in its dust tail. 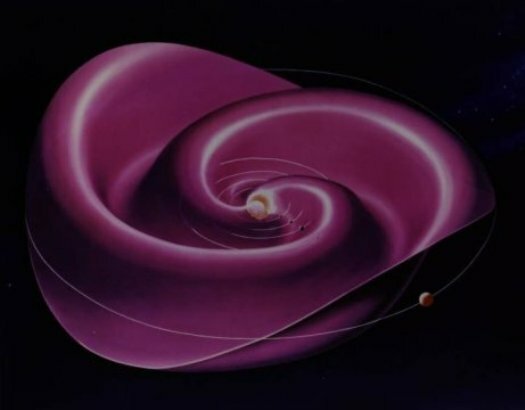 The rift seemed to be located at the heliospheric current sheet, a boundary where the magnetic orientation, or polarity, of the electrified solar wind changes directions. This puzzled scientists because while they have long known a comet’s ion tail is affected by the solar wind, they had never seen the solar wind impact dust tails before. Dust in McNaught’s tail — roughly the size of cigarette smoke — is too heavy, the scientists thought, for the solar wind to push around. On the other hand, an ion tail’s miniscule, electrically charged ions and electrons easily sail along the solar wind. But it was difficult to tell exactly what was going on with McNaught’s dust, and where, because at roughly 60 miles per second, the comet was rapidly traveling in and out of STEREO and SOHO’s view. His solution was a novel image-processing technique that compiles all the data from different spacecraft using a simulation of the tail, where the location of each tiny speck of dust is mapped by solar conditions and physical characteristics like its size and age, or how long it’d been since it’d flown off the head, or coma, of the comet. The end result is what Price dubbed a temporal map, which layers information from all the images taken at any given moment, allowing him to follow the dust’s movements. The temporal maps meant Price could watch the striations form over time. His videos, which cover the span of two weeks, are the first to track the formation and evolution of these structures, showing how dust fragments topple off the comet head and collapse into long striations. But the researchers were most excited to find that Price’s maps made it easier to explain the strange effect that drew their attention to the data in the first place. Indeed, the current sheet was the culprit behind the disruptions in the dust tail, breaking up each striation’s smooth, distinct lines. For the two days it took the full length of the comet to traverse the current sheet, whenever dust encountered the changing magnetic conditions there, it was jolted out of position, as if crossing some cosmic speed bump. Scientists have long known the solar wind affects charged dust; missions like Galileo Cassini, and Ulysses watched it move electrically charged dust through the space near Jupiter and Saturn. But it was a surprise for them to see the solar wind affect larger dust grains like those in McNaught’s tail — about 100 times bigger than the dust seen ejected from around Jupiter and Saturn — because they’re that much heavier for the solar wind to push around. With this study, scientists gain new insights into long-held mysteries. The work sheds light on the nature of striated comet tails from the past and provides a crucial lens for studying other comets in the future. But it also opens a new line of questioning: What role did the Sun have in our solar system’s formation and early history? “Now that we see the solar wind changed the position of dust grains in McNaught’s tail, we can ask: Could it have been the case that early on in the solar system’s history, the solar wind played a role in organizing ancient dust as well?” Jones said.